According to popular belief, Jesus Christ was crucified and buried in Jerusalem in the early to mid First Century A.D. But in actuality (cough! bullcrap!) Jesus escaped and made His made through Siberia to Aomori in northern Japan where He lived out His days to the ripe old age of 106 with wife and kids and was later buried in the village of Shingo. One summer while I was visiting Aomori's festivals in August, I decided to stop in to see this auspicious grave for myself. On a small hill sit two mounds from which two wooden crosses (obviously later additions) stand. These are the graves of Jesus and His brother or at least His brother's ears (it's a long story). Supposedly the story goes that Jesus was not crucified at all but that it was His brother known as Isukuri in Japanese who took the fall. Jesus took His brother's ears with Him and He left Israel far behind crossing over Siberia and coming to the northern area of Japan's main island Honshu from Alaska no less. He gave up preaching and became a rice merchant later having a family. It was said He went around Japan wearing a cape and helping people. Due to His long nose as compared to the Japanese He was thought of as a Tengu, a long nose goblin of Japanese folklore. Eventually Jesus passed away at the age of 106 and was buried along with His brother's ears and the locks of His mother's hairs. It sounds more than a little farfetched but believers claim that there are some mysterious clues in the area that help to support this. The original name for Shingo was Heraimura which some believe is a corruption of the word Hebrew. 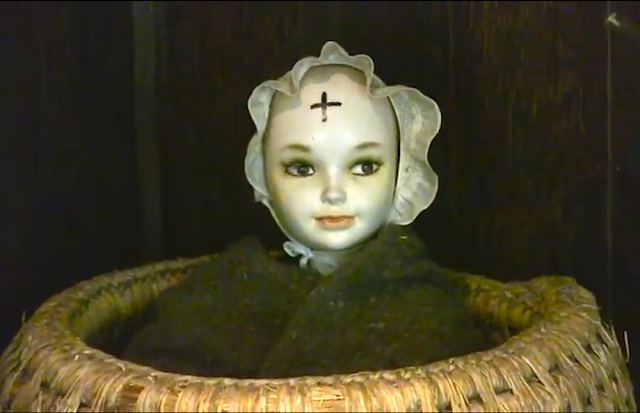 The locals of the area had a long custom of drawing crosses on babies' foreheads in charcoal to protect them from evil the first time they were taken outside. Another local custom is/was to make a cross with salvia on feet and legs when they become numb. In addition there is a local dance tradition called Nanyadoyara whose meaning makes little sense in Japanese. One scholar believes it to be an ancient military song of Judea giving glory to God in Hebrew. Others, however, think it is more likely an old love song sung in the ancient forgotten local dialect. Another supporting claim is the crest of the Sawaguchi family which is thought to represent the Jewish Star of David. The Sawaguchi family is believed to be the descendants of Jesus and supposedly their physical appearance is slightly different than average Japanese owing to this august lineage. They are Buddhists, however. Now just when you think you've heard more than you can possibly believe, the Jesus in Aomori Claim goes even further. For centuries, religious scholars have debated the missing years of Jesus from 12 to 30. In Aomori, that answer is solved. It turns out at the age of 21 Jesus came to Japan and studied Shintoism in Toyama Prefecture for over 10 years before returning to Israel. This information is provided by Jesus Himself in an ancient document known as "Christ's Will." So in modern terms Jesus was a Japanophile or worse a Wapanese, Weeabo, or Otaku two thousand years before Anime. But His crucifixion sentencing showed that even back then people hated these types. All of this came to light in the 1930s when ancient documents were discovered in Ibaraki in the possession of a Shinto priest who later traveled to Shingo to verify the claim. These documents were later taken to Tokyo where they were (conveniently) lost in the war. Later books based on these documents were written that have even more farfetched claims of UFOs and Atlantis. UFOs and Atlantis aside, one of the chief problems with the claim is that it says Jesus learned to read and write Japanese. This is a rather hard pill to swallow as writing did not come to Japan until several centuries later. In the time of Jesus, Japan was in the Yayoi Period, a time of rudimentary civilization that had an unwritten language. The Yayoi people however did grow rice and had some of the basic elements of Shintoism according to Chinese chroniclers. Did Jesus really visit Japan, twice even? I think there may be several possible explanations behind the story though none involving Jesus himself. Tourism would be amongst the first theories but it seems a rather extreme length to go to when there are plenty of Japanese historical and legendary people to lay claim to. For example one of the popular characters is Minamoto Yoshitsune. He was a warrior who lived in the late 12th Century and the figure of a popular cycle of tales that has influenced Noh, Kabuki, and modern culture. Many places throughout Japan claim that Yoshitsune once passed through their area with far more believability. It may be an echo of memory of a Christian missionary from the 16th-17th Century. In the mid-1500s the Portuguese arrived in Japan and a thriving trade sprung up with Japan importing guns and Christianity. Catholic missionaries spread the Gospel throughout the land for a number of decades until the Japanese authorities souring on the deal felt they were getting more Christians than guns. Persecutions became the order of the day and after the failed rebellion of Christian peasants in Shimabara in the mid-17th Century, Christianity was officially outlawed and foreign Christian missionaries required to stay out of Japan on pain of death. It is believed some lived on hidden by the faithful in remote areas and such a place like Shingo would have been ideal for such a missionary in hiding. However one would think there would be more traces of Latin not Hebrew in the area. Another possible theory is that it might have been an even earlier Christian missionary or someone who was Christian but not necessarily a missionary. This early Christian might have come from Israel during the time of Roman persecutions and brought with him/them some of their language and customs. This may seem improbable but one has to keep in mind that the ancient world was not so primitive as we moderns like to imagine. There was extensive trade and travel between the western and eastern world. The Silk Route stretched all the way into northern China and goods from this trade route have been discovered in Siberia. The stories of long-nosed goblins the Tengu and the hairy Namahage devils of neighboring Akita Prefecture suggests the possibility of early contact with non-Asian visitors. A darker theory of mine though suggests that the story might have been made to mesh with the imperialistic mentality of the day when the discovery was made. In the 1930s Japan was becoming more aggressively militaristic and passionately devoted to the Imperial family. By taking one of the wellsprings of Western civilization and claiming there were Japanese roots was definite way of claiming superiority. Regardless of the unbelievability of the claim, it's still a nice out-of-the-way spot to visit and supposedly there are some pyramids in the area too that predate the ones in Egypt. Truly a blessed place! It's actually none of the above. It's a previously uninvestigated subculture I'm writing a book about.